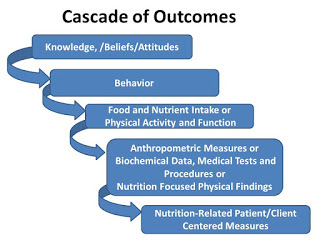 Cascade of Nutrition Outcomes....one thing leads to another!! The critical thinking involved in Monitoring and Evaluation, the last step in the Nutrition Care Process, is the identification of indicators and criteria that will provide evidence that the nutrition intervention of the dietitian is effective. and Criteria all the same thing?? In the Nutrition Care Progress notes, Evidence-Based Practice Guidelines, and references about nutrition care we have several terms that are all used to describe the outcome of our nutrition care.